Larsen Caroline (b. 1980, Canada) Lives and works in New York. received her BFA with honors from the University of Waterloo, Canada, a Graduate Diploma in Visual Arts and Art History Education, University of Auckland, New Zealand, and MFA with Honors from the Pratt Institute, Brooklyn, New York. 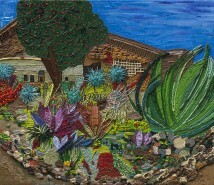 Exhibited in many solo and group exhibitions, mainly in the USA and at Gordon Gallery, Tel Aviv.